With the Galileo Release coming up, you might find yourself having a hard time updating to the latest milestones AND keeping your favorite plug-ins up-to-date. 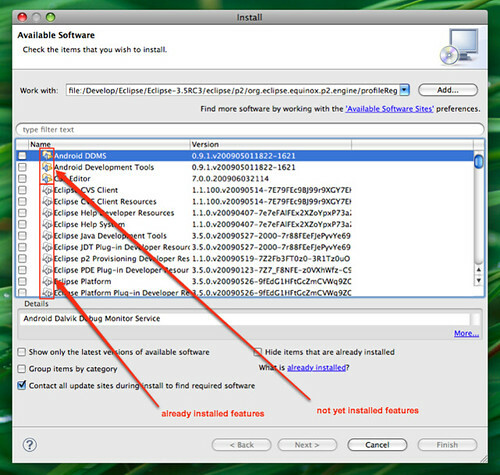 Did you know that you can migrate your additional plug-ins from one Eclipse install to another one? This can be a huge time-saver, especially for people who like to live on the bleeding edge. Let's further assume you've got an existing install of Eclipse 3.5 RC3 Cocoa 32bit with some additional plug-ins, like FindBugs, WindowBuilder Pro, etc. using the file chooser, browse to <path_to_your_OLD_eclipse_instance>/eclipse/p2/org.eclipse.equinox.p2.engine/profileRegistry/SDKProfile.profile/ and click Choose to select that directory. Check all features that you want to transport to the new location and continue the installation by clicking Next>. After confirming the license terms and clicking Finish, Eclipse will install the selected features from the old location into the new location. After the obligatory workbench restart you're good to go. The only thing that I am wondering about is: why is there no first-class UI action (e.g. an import wizard) to do this?